A chocolate shake for breakfast? Of course you want one, but you think you shouldn’t. Well, I’m about to give you permission. This chocolate shake tastes like an indulgent dessert, but it is actually really healthy and full of amazing superfoods. I sometimes treat myself to one after a long yoga practice. Whenever I serve this to friends, they always look at me with a sideways glance when I tell them what’s in it, but once they taste it, they’re impressed. It’s yummy. 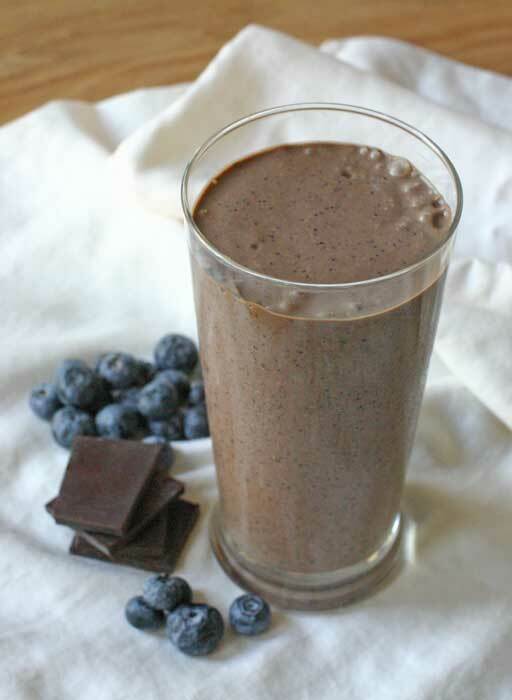 This shake is sweetened by blueberries and bananas. 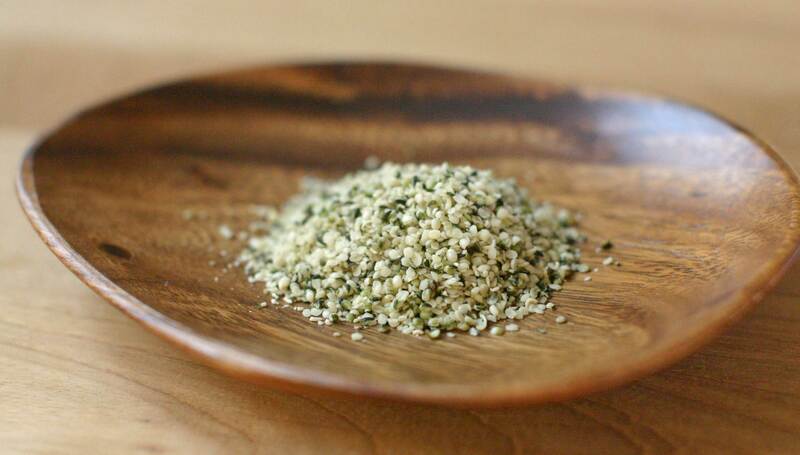 The hemp and chia seeds give you a major protein boost – over 13g of protein in this one serving! The raw ground maca root is energizing and adds a yummy caramel-like note to the flavor, and the raw cacao powder is full of chocolaty antioxidant goodness. Curious for more information? Further details on the health benefits can be found at the bottom of every recipe on this site. Slice the frozen banana for easier blending. Add all of the ingredients to a high-speed blender and blend until smooth and frothy. (A regular blender will definitely work, but in that case you may need to add more liquid to get the ingredients moving, especially if you use frozen blueberries.) This recipe makes one large 16-oz. (pint glass) serving. Tip: If you want to replace a meal with this shake and need something a little heartier, add a tablespoon or two of raw almond butter to the mix. That should keep you feeling pretty full for a little while. By now you’ve probably heard the word “superfood” being thrown around. It’s actually a marketing label and its definition is not scientific. As the term is generally understood, a superfood is a whole food that is naturally rich in vitamins and minerals, with the added benefit of containing a large quantity of antioxidants, which reportedly confer cancer-deterring, anti-aging, immune-boosting, health-promoting, and even beautifying benefits. Some of the common ones include blueberries, cranberries, goji and acai berries, kale and other leafy greens, green tea, buckwheat, quinoa, chia and hemp seed, cacao and maca root, but these are only a few; the list can be quite long. You might think the “superfood” label is a bit dubious, but there may be something to all the hype. Try adding a few new ones to your diet and see how you feel. Raw cacao (pronounced kah-KOW, different from the roasted, refined version we know as cocoa [KOH-koh]) is full of antioxidants, and studies suggest that cacao may also help promote healthy circulation and blood pressure. In its raw form (unheated, unrefined, without the sugar, milk fat and hydrogenated oils often added to commercially available chocolate candy), it is beneficial to the human body and is known to boost the level of certain neurotransmitters in the brain such as serotonin and endorphins, which produce a mood-boosting, anti-depressant effect. Maca is a root vegetable native to the Andean region and is rich in antioxidants, vitamins and minerals. It is known for its energizing effect and the way it helps to balance hormone levels, promoting healthy sexual and reproductive function in both men and women. Blueberries are a good source of Vitamin C and K, but they achieved “superfood” status for having a high phytonutrient content. These antioxidants are known to reduce the effects of oxidative stress on the whole body (anti-cancer, anti-inflammatory, cardiovascular and circulatory support, muscle repair, and reportedly even memory boosting benefits). Coconut milk is a liquid made from coconut flesh and water; it is not the water found inside the coconut (that’s called “coconut water”). Its biggest claim to fame is that it contains lauric acid, a medium-chain fatty acid that is quickly metabolized by the human body and is the most abundant fat found in human breast milk. Lauric acid is believed to promote healthy brain and bone development. 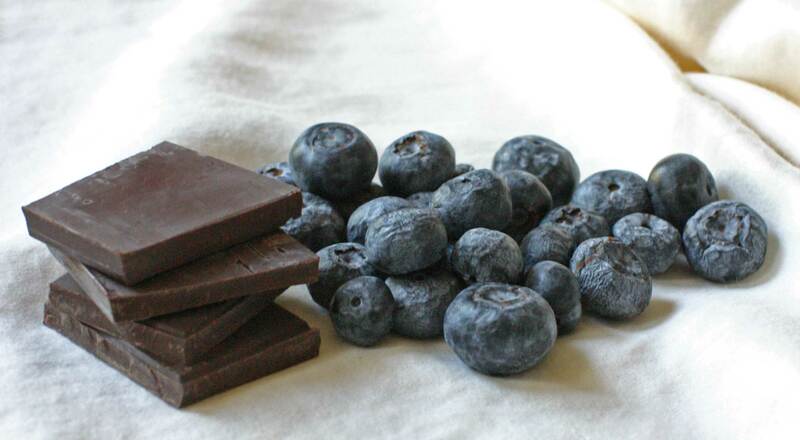 What’s your favorite superfood? Tell us in a comment below! 10 Responses to "Chocolate Superfood Shake"
Hi Stefanie, I love that this shake not only contains superfoods, but that it seems to contain a such a varied mix of them, so it definitely looks replenishing in every way. Have you looked into raw maca vs. roasted? It seems people have different opinions on which is better and it is pretty confusing. Thanks! Hi Katherine! I originally learned about maca in some of my raw food cookbooks, and so had never considered the roasted variety, but I did a little research in response to your question. As far as I can tell, the heating process (also sometimes referred to as toasting or gelatinization) reduces the starch content of the maca root, which makes it easier to digest, but it also alters some of the nutrients and destroys the enzymes. This is troublesome for raw foodists who want to eat exclusively raw foods with their natural enzymes intact. However, I read that raw maca can cause an upset stomach for a small percentage of people with sensitive stomachs. One of the best sum-ups I read was that raw maca is more like a food and cooked maca is more medicinal (concentrated). I don’t know anything about taking maca as an herbal medicine. But the benefits and effects of consuming maca seem to vary widely depending on the individual, hence the difference of opinion on this matter. I’m sorry I can’t give you a more cut-and-dry answer, but I hope this helps a little. I have not heard of maca! Where is the best place to find it at Whole foods type stores?? With baking, spices?? Hi Amie, I buy mine on line at Nuts.com. At my local WholeFoods, there is section right at the front of the store, basically in the produce department, of items that appeal to raw vegans, and that’s where they keep the maca. At the big Wegmans store near my parents’ house, it’s in the “natural foods” department near the baking items, next to the hemp seeds and other products from the brand Navitas Naturals. So far Nuts.com seems to offer the best price that I’ve found, but there will also be a (very reasonable) shipping charge that depends on where you live (they ship from NJ and delivery is always super prompt). I usually place one large order for lots of different ingredients at once to defray the impact of the shipping costs on my food bill. Hope this helps! I have been making this smoothie for several mornings now and it is a keeper! I didn’t have the maca root powder (I just found it today at Wegmans) so I will try it tomorrow with that added. In the evening I measure the dry ingredients into a container and pop it in the fridge to help speed me along in the morning. In the morning I throw all the dry ingredients in my Osterizer blender and give them a whirl before adding the banana, berries, and liquids and it results in a nice smooth consistency. It makes a lot and keeps me full for hours! I’m going to see if i can get my hubby to try some tomorrow. Thanks for the recipe. I’ve also made it now and love it! Much better that my premixed Vega shakes! Do you think that this will keep in the fridge if I make it the night before? Also, if you wanted any blogging ideas I’d love to hear more about where you get all of your awesome ingredients and how you store them. Sometimes its that part thats more challenging for me than the cooking! Well, it won’t be as shake-like (maybe more liquidy instead of frozen), and it will almost certainly separate a little overnight, but if you keep it in the blender all made, you could always stick the blender bucket back on the machine and give a whirl right before you drink it. I would recommend maybe following Tish’s advice in another comment here instead, and just assemble the ingredients the night before. Actually blending it should be a pretty quick task if the rest is all ready. Also, those are good ideas for future posts. I’m already working on a whole article about maintaining a vegan pantry, and another one about where to buy the staples, so I’m really excited that you’re interested! Thanks for the ideas, please keep them coming!! Thank you so much for posting this recipe. We’ve all been enjoying these shakes & feeling good about it! Great way to start your day and it keeps you feeling sated for quite a while. keep the great recipes comin’! Approximately how many calories in one glass?